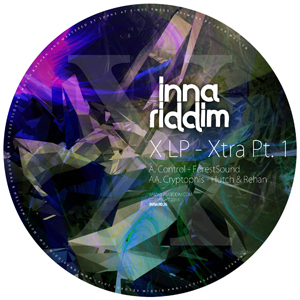 To whet the appetites of bass aficionados everywhere for the two-part X LP (a pair of ten-track albums that mark Inna Riddim’s ten years of pushing bass music from across the spectrum) this release is a little extra: two exclusive tracks that emphasise Inna Riddim’s longstanding drum&bass heritage. ForestSound’s ‘Control’ is a dark and minimal drumstep number, fuzzy sub and gnarly bass staging ambushes on each other like sharks and killer whales in a reef of clipped, precise beats and occasional fragments of breaks. ‘Cryptophis’, by contrast, is full of the energy displayed in production duo Hutch & Rehan’s live sets, with a hard, driving back beat, surging basslines and rough-textured synths.